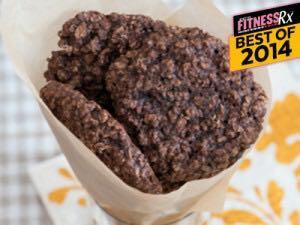 If you enjoyed my Oatmeal Raisin Protein Cookies, then you are going to love these! As we know, there’s just something about warm cookies fresh out of the oven that can’t be beat! However, you might avoid making them because you either don’t know how, think it’s too time consuming or only see recipes that are loaded with excess fat and sugars… well, it’s time to erase all of those thoughts and get to baking! I’m bringing you a delicious Chocolate Almond Protein cookie that takes only 10 minutes to bake, has only 115 calories, no added sugar, and 9 grams of protein! 2. Coat a cookie sheet with non-stick cooking spray and set aside. 3. In a mixing bowl, combine applesauce, egg whites, and almond butter; mix well. 4. In a separate large mixing bowl, combine oats, coconut flour, protein powder, cocoa powder, salt, and stevia; mix well. 5. Add the dry ingredients to the bowl with the wet ingredients and stir until the mixture is well blended and a dough is formed (if your dough is too crumbly, add water 1 TB at a time until dough is formed). 6. Scoop your dough into even portions onto the cookie sheet. 7. Bake for 10 minutes. 8. Remove cookie sheet and let set for 10 minutes before moving to a wire rack to cool. Enjoy! !